Our club has been extended a special offer of a 20% discount on any items purchased online at RideMakerZ. This offer is only for online purchases and for a limited time. Check out This Link for a ShineBox registration page and a discount code. You will then be directed to the RideMakerZ site where you can pick what you like. Enter the registration code at checkout for the 20% discount. Enjoy building or upgrading your car. WRAPUP: The Autocross day was hot, cold, sunny, windy and rainy at various points. 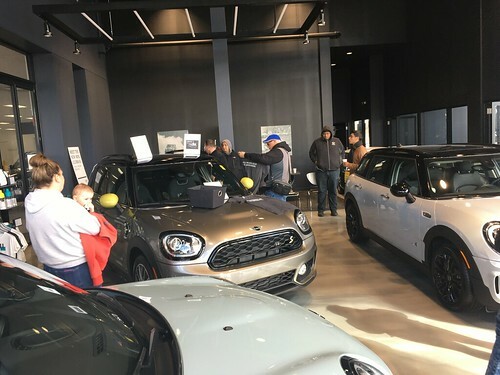 Six MINIs accepted to the challenge and attended the event, and one more stopped by to visit, and check out the action. Lots of Miatas, a bunch of Honda S2000’s, a few Camaro’s, Vetts, Subarus, BMW’s and other cars were in attendence. People were broken out into 3 groups, to alternate working, resting and driving. Everyone was allowed 5 runs in the morning sessions and 6 runs in the afternoon session. 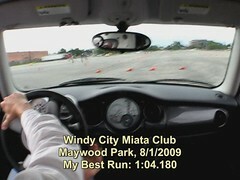 When the dust settled, the fast car of the day was a very modded Miata running 1 minute and some change. Everyone had lots of fun, made squealing tire noises, and had a good time. Some of us even learned a little bit. The Windy City Miata Club were wonderful hosts and it was really nice for them to invite our club to participate with them. Congratulations to Russell for being fast guy of the MINIs! The weekend starts easy enough. 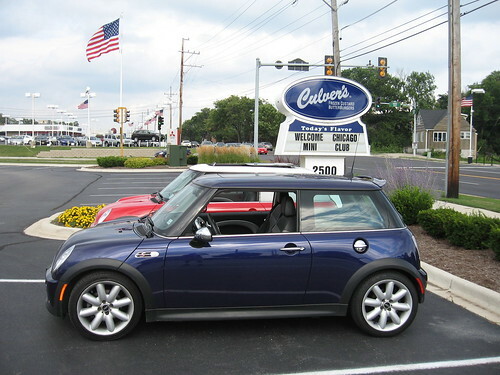 I pick-up my Horizon Blue Cabrio from Patrick MINI after work Friday and drove it home (top-down of course). The latest version of the Cabrio is pretty neat. But I’ll need a longer test drive before I turn my car in for a new one.